A true backcountry experience in the heart of the Southern Alps, this walk/raft combo is an amazing way to appreciate the unspoiled wilderness of New Zealand. Our adventure crosses the Main Divide on foot, then floats and paddles our way down the remote Landsborough River by raft. A fully guided trip, clients will not need to carry heavy backpacks as all food and other necessary equipment will be provided for. Far from being a journey “on the beaten track”, this trip takes you to high alpine landscapes and country not visited by the average tourist! Day 1: Drive from Queenstown to the Ohau Lodge. From here we travel about 1.5 hours up the Hopkins Valley to the start of the walk. 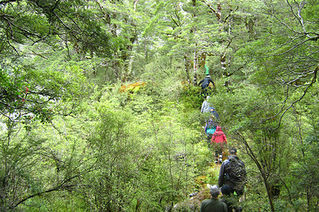 A reasonably gentle walk to Forks Hut takes about 2-3 hours and from here the track climbs up the Huxley Valley to Brodrick Hut for about 2.5 hours. This is the where the first night will be spent. Day 2: Climb approximately 1,400ft from Brodrick Hut to a campsite near Brodrick Pass where camp will be set up for the night. Take in the stunning views from this lofty campsite – a beautiful spot to absorb your surroundings. Day 3: This day is spent descending into the Landsborough valley through an open hanging valley from the open alpine peaks into native bush. 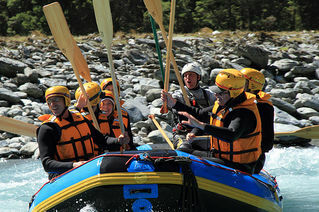 A helicopter will meet walkers at Creswicke Flat at the bottom of the valley to transport them to the top Queenstown Rafting Landsborough camp where you can relax and enjoy a delicious 3 course meal prepared for you. Day 4: Begin with a leisurely breakfast then prepare to leave camp for your rafting adventure. A full safety briefing and information on river protocol will be given before you depart. Today you have a five hour river trip catering from action to the sedate, stopping to enjoy a deli-style picnic lunch above Hellfire Rapid then continue down river arriving at Harpers Bluff, our second camp. There will be time to try out a spot of fishing or go for a walk before dinner. After dinner explore the surrounds and maybe even discover a glow worm or two. Day 5: Another filling breakfast will set you up for the day’s activities. Board your raft and head down river to Purple Creek for lunch and a side hike to explore the waterfalls. After lunch it is a leisurely float downstream to our take out point at Clarke Bluff. Bus back to Queenstown.